Kenneth Van Sickle has made a significant contribution to the work of Tai Chi Chuan through his practical teachings, his photographic and film work, and through the quiet, understated manner with which he dispenses deeply profound insights on the application of Tai Chi Chuan as a tool for personal cultivation. 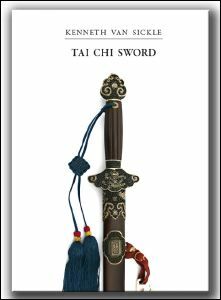 Much has been written on the practical, theoretical and historical aspects of Tai Chi Chuan but until now little has been produced looking specifically at Tai Chi weapons. Of all the weaponry in the Tai Chi arsenal the sword is widely considered to be both the subtlest and the most sophisticated, requiring a thorough understanding of the higher Tai Chi principles such as ‘listening’, focus and fluidity. Kenneth Van Sickle leads the reader through the various attributes of this, the most gentlemanly of weapons, with the eye of an artist and the soul of a poet. “All those taking up the way of taiji sword today are working to recapture the spirit of the Jianke – the Chinese swordsman. We do this by wielding our jian alone, walking through the form, pratising test cutting, and with another, in action. In his book, TAI CHI SWORD, Kenneth van Sickle takes into his world, his like with the Chinese sword, sharing his insights into this way. Kenneth Van Sickle’s book will provide food for thought, or as he writes in his introduction, “something to chew on”‘ for those interested in taking the way of the Jianke. Scott M.Roddell, author, Chinese Swordsmanship – the Yang Family Taiji Jian Tradition, Taiji Notebook for Martial Artists, Test Cutting for Historical Swordsmanship, and Traditional Manchu Archery of the Qing Imperial Guard.